The ELI-3360 maritime patrol aircraft is designed by Israel Aerospace Industries’ subsidiary ELTA Group. Image: courtesy of Israel Aerospace Industries Ltd. The ELI-3360 MPA is based on the Bombardier Global 5000 business jet. The ELI-3360 is equipped with the advanced ELM-2022 maritime patrol radar. Image: courtesy of Israel Aerospace Industries Ltd. The new generation ELI-3360 maritime patrol aircraft (MPA) designed by ELTA Group, a subsidiary of Israel Aerospace Industries (IAI), was introduced in February 2015. 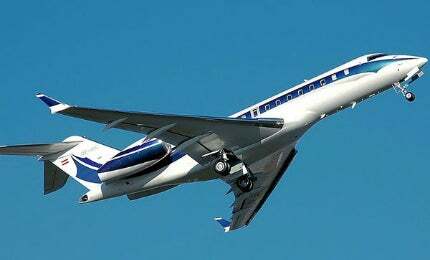 The aircraft is based on the Global 5000 business jet developed by Bombardier Aerospace. The ELI-3360 MPA is intended to provide naval forces with intelligence, surveillance and reconnaissance (ISR) mission capabilities. It can also be deployed in broad area persistent theatre monitoring, anti-submarine warfare (ASW), anti-surface warfare (ASuW), and communications, command and control (C3) applications. It can also be configured for para-military / civilian applications such as maritime patrol, homeland security, law enforcement, search and rescue, shore and exclusive economic zone (EEZ) protection, and customs and drug enforcement, as well as immigration / naturalisation control, disaster monitoring, fishery control, and environment control. The ELI-3360 maritime patrol aircraft features a modular design. It offers multi-mission support and maritime superiority over a wide area, under all weather conditions. It can be deployed quickly and can be operated autonomously. The base version has a length of 29.5m, wing span of 28.7m, height of 7.7m, and wing area of 94.9m². It features swept wings, winglets and a vertical T-tail and is attached with tricycle-type landing gear. The MPA in business-jet configuration is manned by two pilots and two observers. State-of-the-art surveillance and reconnaissance systems are included on the aircraft to provide enhanced, real-time maritime situational awareness, as well as to offer better flight endurance and extended range. The ELI-3360 MPA can be equipped with a variety of weapon systems, such as torpedoes and anti-ship missiles for effective ASW and ASuW operations. The ELI-3360 MPA is equipped with the advanced, multi-mode ELM-2022 maritime surveillance, imaging and tracking radar and the ELL-8385 ESM / ELINT system, both developed by ELTA Systems. The ELM-2022 maritime patrol radar is used to detect and track maritime and airborne targets. It also provides spot-SAR imaging, weather / storm / turbulence avoidance, and Ground MTI tracking over-SAR (GMTI/SAR) image. "The ELI-3360 MPA is intended to provide naval forces with intelligence, surveillance and reconnaissance (ISR) mission capabilities." Tatical and strategic ELINT data is collected and analysed by the ELL-8385 ESM / ELINT system. It is also used for long-range, high-endurance electronic support measures (ESM) and electronic intelligence (ELINT) operations. The comprehensive communications suite in the MPA comprises broadband SATCOM, radio communications (HF, VHF, UHF), and data links. Electro-optical (EO) / Infrared (IR) sensor payloads are featured on the airborne system. These are used to provide real-time imagery and day / night observation. The system also features advanced C4I systems, electronic warfare (EW) suite, automatic identification system (AIS), identification, friend or foe (IFF), advanced tactical management system, and self-protection systems. The integrated multi-mission command and control suite onboard the ELI-3360 maritime patrol aircraft helps to monitor and control the flight planning, surveillance equipment, and armament. It incorporates a weapon and stores management system to control the under-wing weapons. Also fitted on the command and control unit is flexible, multi-purpose, and interchangeable operator workstations, with two to four mission operators. The unit receives real-time flight data through data links, and delivers the same to the users and network-centric warfare system. The base variant is powered by two Rolls-Royce Deutschland BR710A2-20 turbofan engines, which generate a thrust of 14,750lb each. It can fly at a typical cruise speed of 902km/h. The maximum speed is 934km/h, and a range of 9,630km is offered.